It's not like had 14 miles to think about what I was going to say or anything. In fact, I really had months to think about exactly what I was going to say...but I'll get to that later. 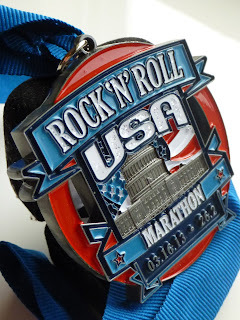 Before I get into all of the details about what happened at mile 14 of the Rock 'n' Roll USA marathon last weekend, I want to provide some background on how I got there...besides the obvious running the first thirteen miles of the race! As I mentioned in part 1, Michelle and I had originally planned to spend spring break in the Outer Banks...which would have made for a more "private" event, but after some consideration we decided against the 'Tour de Virginia' for numerous reasons. So it was back to the drawing board. Coordinate with a band along the route to play the song - Ho Hey by The Lumineers. Logistically timing was the issue here. 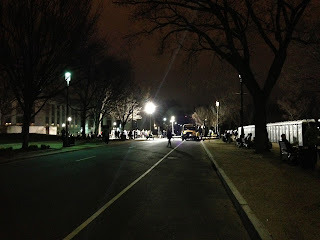 Although I had a pretty good idea of what I would run pace wise it would have been difficult for the band to pick me out of the crowd of runners, all 30,000 of us, and coordinate when to start playing the song. 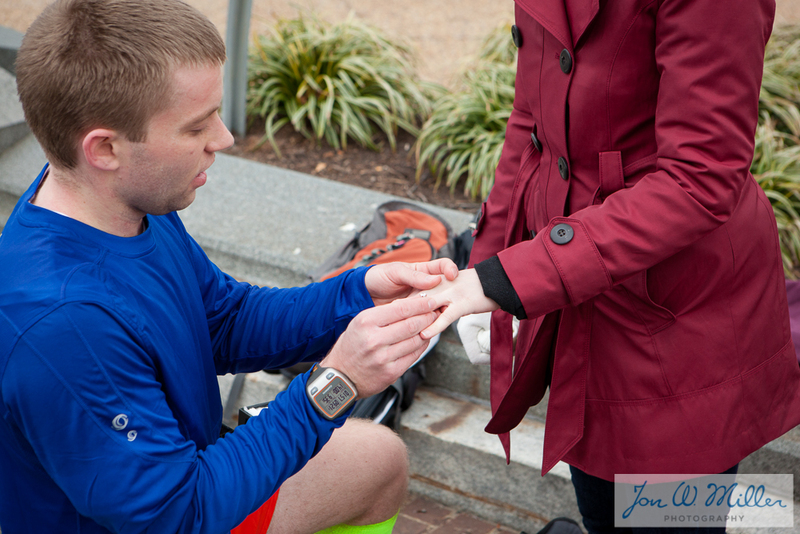 Have a shirt screen printed with "Will You Marry Me?" on it. I actually wore the shirt during the race I planned to have screen printed (a plain white Brook Podium tee) but again figuring out when to put the shirt on and really I wanted to be the one asking, not the writing on the shirt. I eventually decided against this one and it's a good thing I did; the weather didn't play nice and could have made things go awry. Have someone hold a sign or have a banner made. Again, I wanted to be the one asking and hence why I finally opted for how I did it...I'll get to it. With Michelle's parents blessing, I began planning. At the outset of the ring process, I didn't really have a specific date or timeframe but once I got the ball rolling and realized that it could be ready by the time I was supposed to run Rock 'n' Roll, I began planning as if it would and hoped for the best. As a side note, this is for all of the guys out there: when considering a timeline...plan for 6-8 weeks to get the ring. 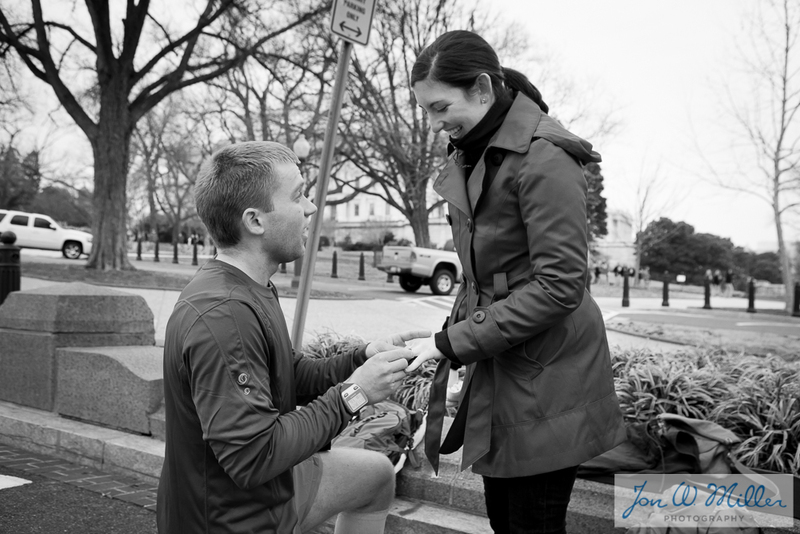 I knew I wanted pictures of the event and as I specifically told the photographer, "getting her reaction is most important." 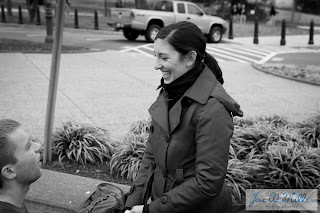 Having a friend who's profession is photography...well...that helps! I called Jonathan in early February to see if he was available that weekend, I had my fingers crossed because it wasn't really "wedding season" yet, to my relief he was and we put it on the calendar! Picturesque huh? 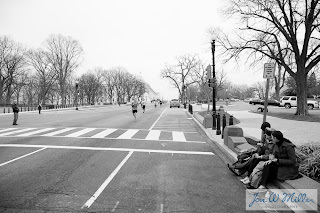 After looking at the course map again and realizing that most trees do not have leaves in mid-March, I decided that there was one more great opportunity right before mile 14 on Constitution Avenue near Upper Senate Park, directly across from the Capitol. This was a great location for lots of reasons. It wasn't too early into the race or too late...which could have been catastrophic because I was hurting pretty bad late in the race. The fact that it was a half mile or so before two of the bands, the Rock 'n' Roll series races have bands every two miles or so along the course, meant there wouldn't be huge crowds because they would probably be near the music. Finally, the location was on a downhill which meant I had a good perspective for scanning the crowds to easily find Michelle and my family. The location turned out to be beautiful. Even better was that the rain decided to hold off. 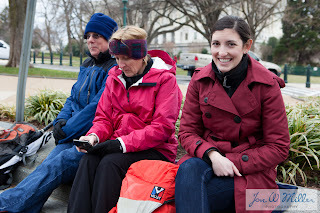 Initially the predictions were rain all day and temperatures in the mid-40s, basically downright miserable weather. It could not have been better! For those familiar with race photography, you know how expensive purchasing prints and photos from the "official" race photo company can be...the perfect excuse to have a friend, who's a photographer, come to watch you run and "take photos" of you along the course. I sent him the Google Street View link so that he could scope out the area and would know where to meet my parents. Also of note is that while my dad knew what was about to happen, my mom had NO idea. As you can see in the photo above there aren't a ton of people at this location. Michelle and my parents waiting around for me to come...probably thinking "why isn't he faster?" One of my favorite photos. My dad is trying his best not to let the secret out of the bag and you can see him smirking there because he know why Jonathan is really taking the photos! At this point Michelle is trying to wave me down...you can just barely see me in the distance to the right of the guy in the green shirt. You can probably see my neon socks which made for awesome photos! When I came over the top of the hill I pretty easily spotted Jonathan on the left side of the road (Thanks for wearing Hokie colors!) and positioned myself to run on the left side of the road until I arrived where they were standing. The whole thing is somewhat of a blur...I mean I did just run 14 miles at roughly 8:30 minute miles...but the first thing I said was "Hey, I'm cramping pretty bad I need my other shoes" which I had planned because I knew this would distract Michelle while she looked through all of my stuff (note the MASSIVE red backpack she is wearing!) 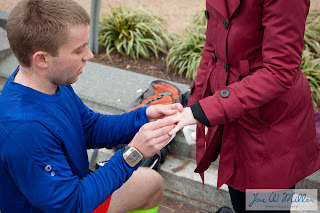 while I took off my hydration vest and removed the ring. 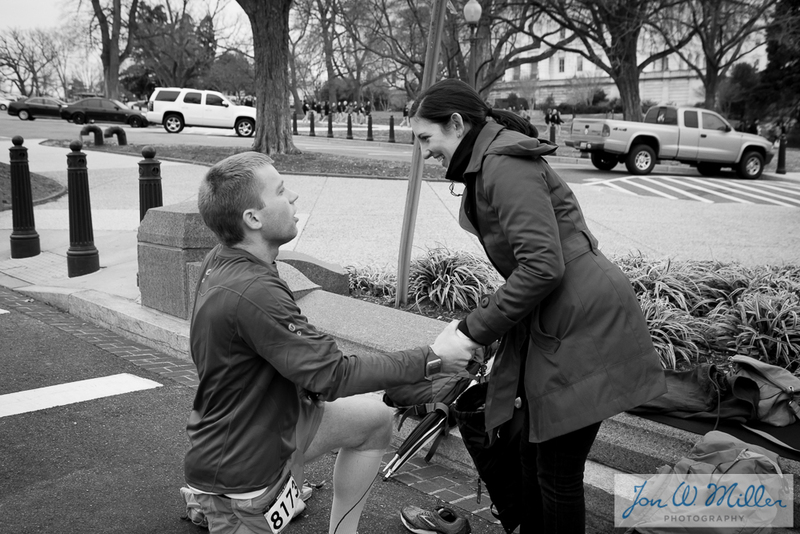 Once I had the ring out out my hydration pack, it was in the case and in a plastic bag, I grabbed Michelle's hand and got down on one knee. You can see she is still holding the bag that she pulled my shoes out of and has somewhat of a confused look on her face. Right before asking. Note: at some point she just decided it was appropriate to drop the bag in her hand... you can see the massive red backpack with all of my stuff. Also...if you zoom in you'll see a huge group of people between Michelle and I off in the distance (wearing khakis) who went CRAZY when the realized what was happening! All of them were jumping up and down and clapping and yelling! For the most part...I wasn't very winded or nervous. I was wondering if I was going to be too out of breath to ask but I remember my voice being distinctly calm and clear. 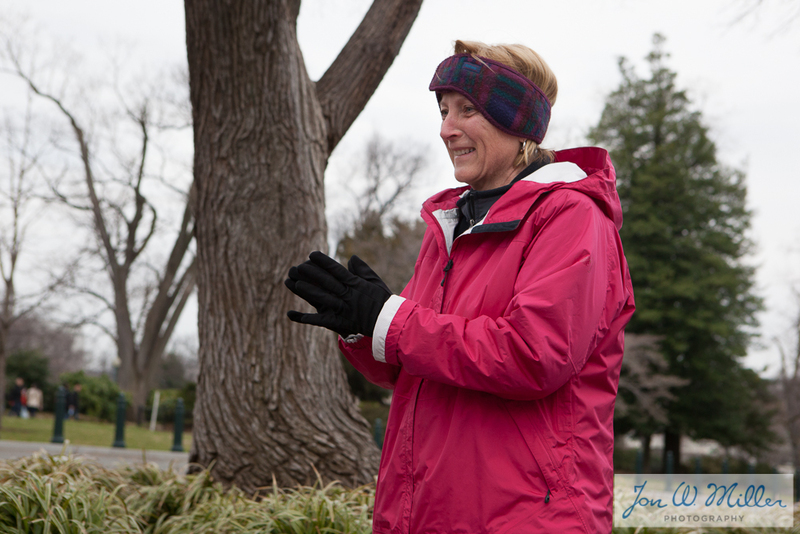 At some point during the exchange Michelle laughed and said "I shouldn't have been wearing gloves" which I think we all laughed about. Funny story: One day while Michelle was working out I snuck into her drawer and ran to the "bookstore" (I actually did go there too) but took her class ring to the jeweler to have it sized. I felt so clever and proud for sneaking it in and out without her ever realizing or suspecting. It fits perfectly! 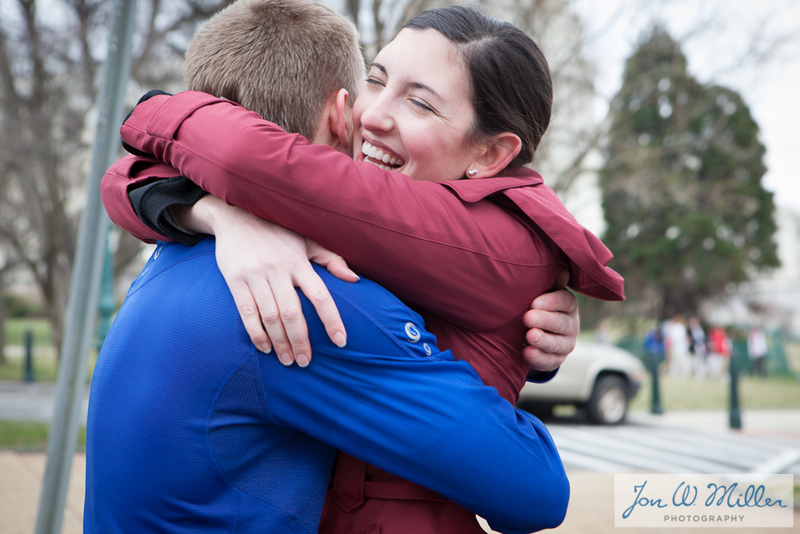 Our first kiss as an engaged couple! 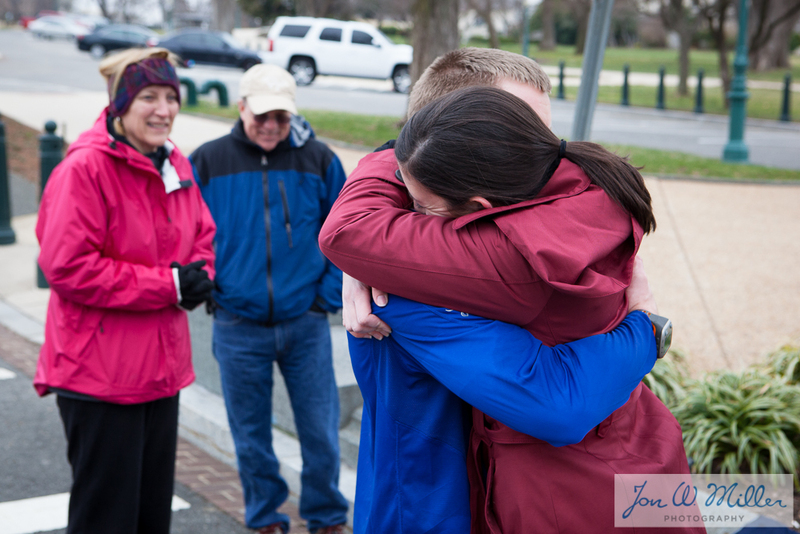 My mom got a little emotional...as she was completely unaware and just as surprised as Michelle! My idol. A phenomenal husband and father. 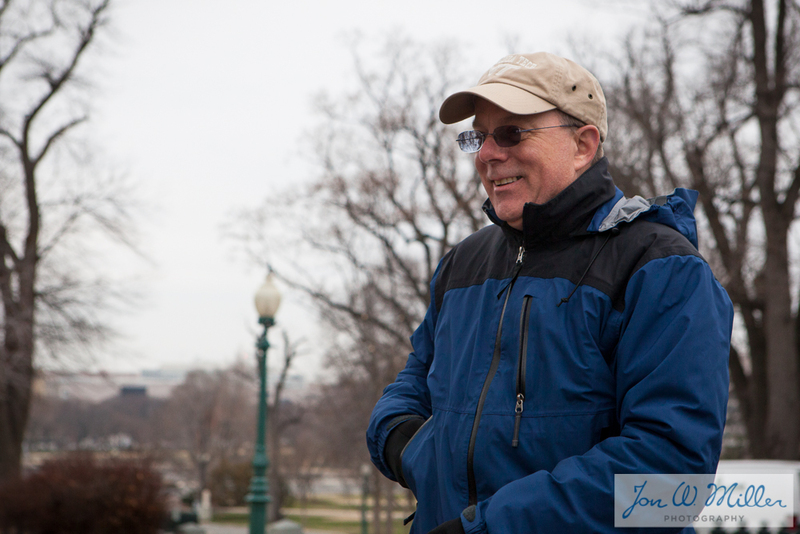 Thanks for making sure everyone "was in the right place" and ensuring the whole thing went smoothly. Jonathan did a phenomenal job capturing the emotion of the moment. A feeling that still hasn't really sunk in. I am so glad, and fortunate, that my parents were able to be there for it. So a slight confession. I have a terrible time smiling for photographs. 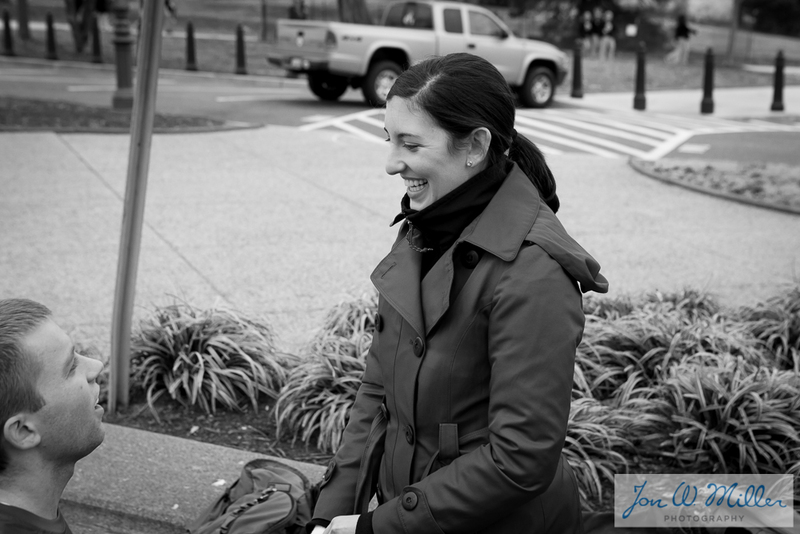 There are few photos that capture a real genuine smile from me. This is one of them. My favorite of them all! I love this one. She kinda has that same look when someone in a movie is walking away from a car or building that is about to blow up and they're walking calmly...kind of like "BOOM...just got engaged!" 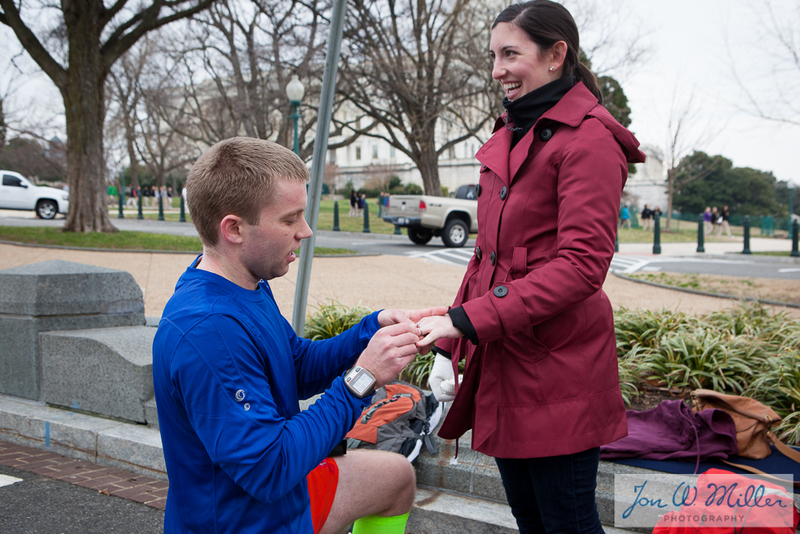 Everyone running by clapped and cheered and asked if she said yes (of course she did!). At this point I really didn't want to finish the race but made a joke to lighten the situation "So...I'm supposed to go finish this marathon thing?" to which everyone laughed and I responded "but I seriously am cramping bad and need water, do we have water?" I grabbed a few bottles (sorry Jonathan) and threw them in my hydration vest and took off running down the street. Right down at the bottom of the hill was a water station where I grabbed a cup of Gatorade in an attempt to prevent cramping later on but I knew I was in serious trouble and once you get to that point you can't catch up. The next few miles went rather quickly with only few a minor "hints" of a cramp but no full leg-locked rolling on the ground type cramps. Those came at mile 19, 22, 23, 24, 25 and lots of increments in-between. 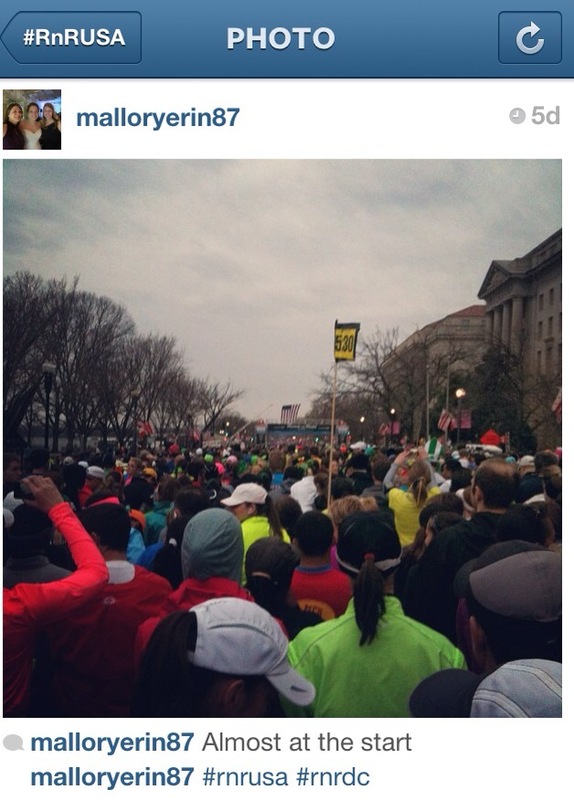 The back half was tough for me and all I could think about was how I could easily quit and hop on the metro to RFK. I have never DNF (Did Not Finish for you no-runner folk) and was NOT about to start right after proposing. On the bright side, pun intended, the sun did come out around mile 17 and it warmed up enough that I decided to ditch (read: put in the elastic straps on my hydration vest) the long sleeve shirt I was wearing which helped me gain composure for a few miles. I have absolutely no idea why I cramped as badly as I did, I thought I was taking in enough hydration and followed my typical electrolyte intake. Some days your legs have it and others they don't. The final six miles were a lot of run-walk-walk-jog-cramp-walk and repeat. Eventually, I managed to make my way to the final bridge where you can see RFK just teasing you and decided I was not going to stop running until I crossed the finish line. To which I stayed mostly true. 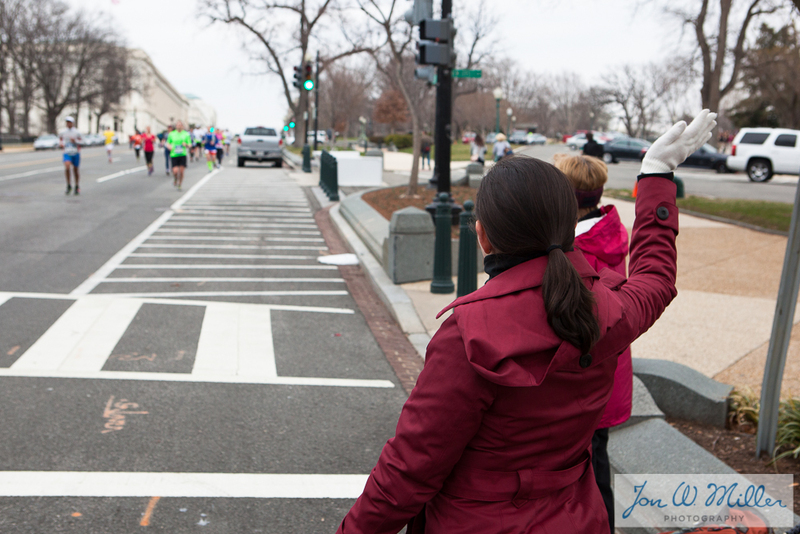 The first five minutes after crossing the finish line are the worst. All these people try to hand you stuff (bananas, bottles of water, gatorade, etc.) and put a medal around your neck (side note: there should be a minimum height requirement for people doing this, for no reason should I have to bend halfway-over for the person to put it on after running 26.2 miles!) and all you want to do is lay down. Unfortunately they had run out of chocolate milk by the time I came through so instead I headed over the Michelob Ultra post-race party to replenish all of those carbs! 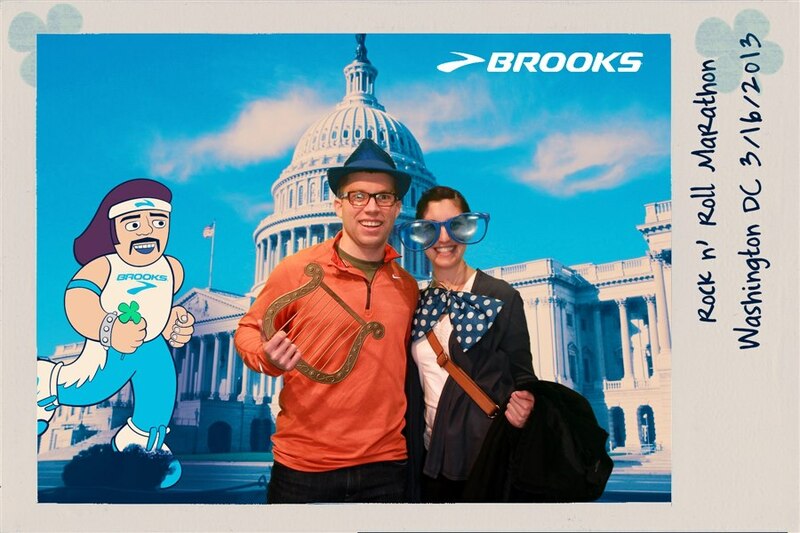 Michelle and I hanging out at the post-race party! Of course I wish I had run faster and not cramped as severely as I did but I think the below tweet after the race says it all! As a tradition, we went to Shake Shack after the run and enjoyed the best burgers known to man. Afterwards, we hopped on the metro and headed home. 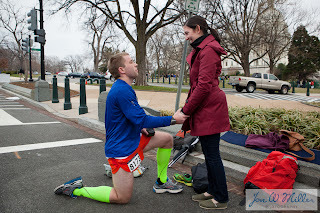 The day wasn't really about the run for me but the details of the Garmin file are below. Of note is that I forgot to stop my watch after the finish line. No. The last .76 miles did not take me 16:36! To say that it was my best marathon would be a lie but I can honestly say it is one of the best days of my life! I really enjoy writing this blog and having the opportunity to share such a special day for Michelle and I with our friends and family! If you feel inclined, leave us some love below, I always make an effort to read and respond to comments! Posted by Unknown at 6:16 PM , Links to this post , 1 comments I'm reading from MyDailyGround: The Proposal - Rock 'n' Roll USA(DC) Marathon Race Report Pt. 2 Tweet this! 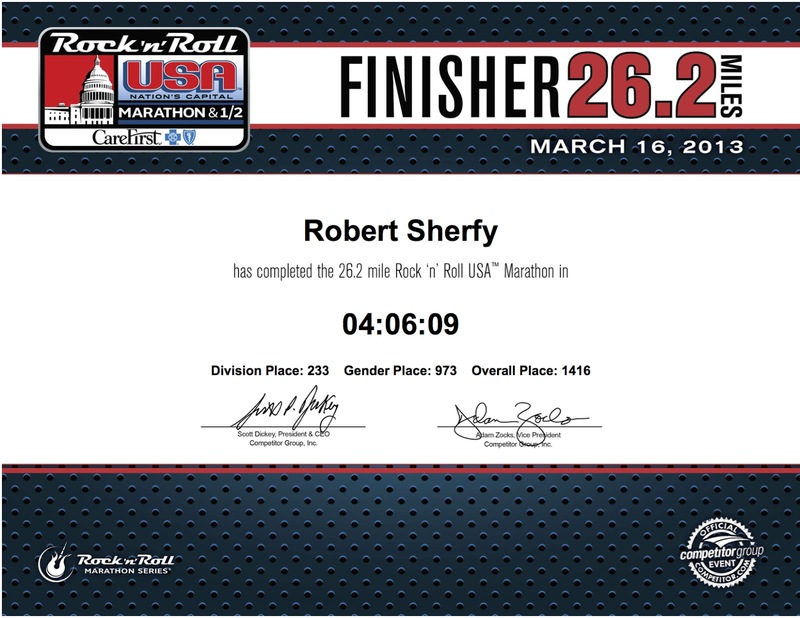 I wouldn't say registering for the Rock 'n' Roll USA Marathon last November was a bad decision, but instead just another example of my "post-race" registration addiction. I went back and checked the receipt from when I registered...it took me all of three days after the Marine Corps Marathon to register for Rock 'n' Roll USA. The first step to recovery is admitting the problem. Two nights ago, I registered for The North Face Endurance Challenge 50 Miler...two days after the Rock 'n' Roll USA Marathon. The trend is going in the wrong direction. I have a problem. 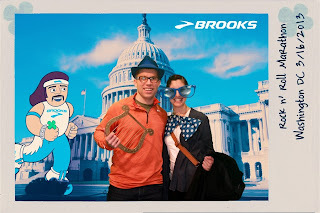 When I signed up for the Rock 'n' Roll USA Marathon, Michelle and I were planning to spend part of spring break in the Outer Banks (at the time more than 4 months away) and then travel up to Northern Virginia/DC area for the race on Saturday. Logistically, I was already planning to be in Virginia Beach for the Virginia Council of Teachers of Mathematics conference the Thursday-Friday-Saturday at the start of break, which meant Michelle would meet me in Virginia Beach Saturday afternoon and we would travel down to the Outer Banks following the conference. Eventually, we decided against the 'Tour de Virginia', mainly because of how many miles we would travel and I didn't want to be exhausted and drained from traveling prior to the race, instead we opted to spend the first half of spring break relaxing in Blacksburg. After relaxing for the first half of the week, both Michelle and I agree we should have been more productive with these few days, we traveled up to Northern Virginia on Wednesday morning. It's always great traveling home to spend time with family, I was especially looking forward to this trip because of what I had planned for the marathon on Saturday, more about that in Pt. 2. 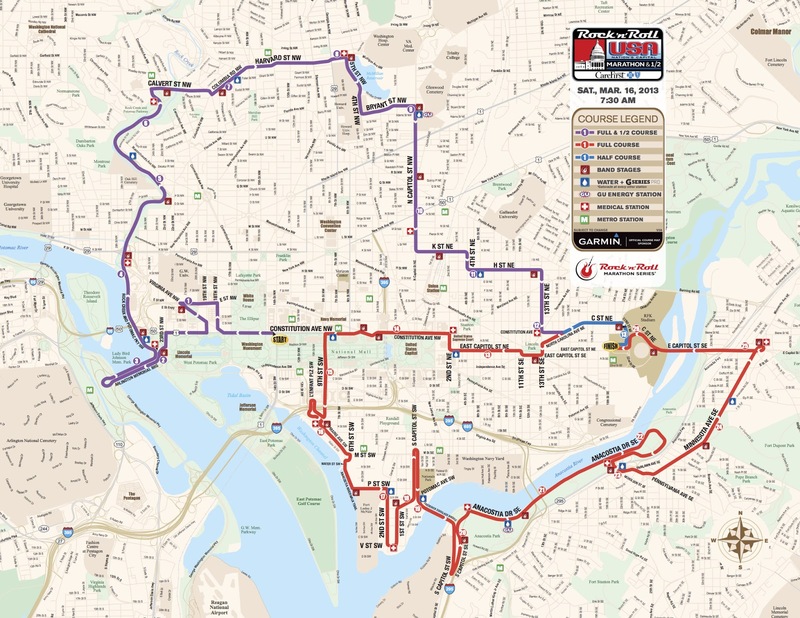 On Thursday morning, after a trip to the dentist :-(, Michelle and I drove to Dunn Loring and took the metro into DC for packet pickup at the DC Armory. Having two days of the race expo for packet pickup was great. Being able to go the first day was even better. For the Marine Corps Marathon packet pickup last fall, I drove to the expo straight from Blacksburg after class Friday morning which turned out to be a nightmare; parking was impossible (a costly $100 parking ticket) and the expo was packed with folks swinging by after work. The Rock 'n' Roll organizers added incentive for runners to attend the expo Thursday instead of Friday by automatically entering Thursday attendees for various raffle prizes including an iPad, judging by how many people were there around 1PM on a Thursday afternoon I'd say it worked. 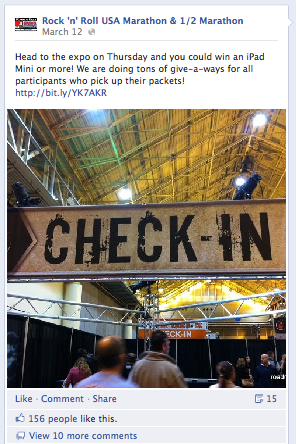 Rock 'n' Roll USA Facebook page convincing runners to come to the expo on Thursday! Most of the time, I try to get in-and-out of race expos as quickly and painlessly as possible, especially if I'm alone, but having Michelle with me made the whole experience more fun...well at least for me. I may have been walking around like a chicken with its head cut off. Michelle was patient. Very patient. Rock 'n' Roll Banner in front of the Armory right off the metro. I didn't even notice RFK last fall when I came down for the Marine Corps Marathon packet pickup. In my defense, there was a huge tent outside for race number pickup which was probably blocking the view...yeah I'll go with that! There can't be too many race expos where you have to go through a metal detector prior to gaining entry! The view upon entering the Armory. The 10000+ seats were collapsed to make room for the expo. The lines were not too bad, but it was only 1PM on a Thursday afternoon. I looked to Michelle and said "I can't imagine this place tonight around six after all the folks swing by after work. SO glad we came now!" She concurred. 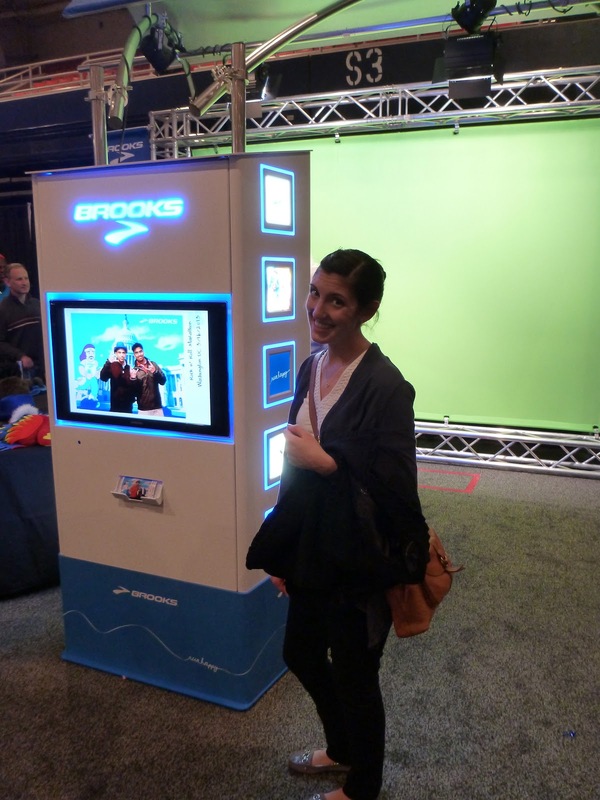 After walking through all of the Brook Rock 'n' Roll apparel we stumbled upon the Brooks Smile Machine! Michelle waiting for our photo to print! What was really awesome was the QR code on the bottom of the photo that allowed you tag the photo on Facebook and be notified when the photo was uploaded! It did take some time for the photo to finally upload, Tuesday, which is kind of a bummer but neat that it worked and appeared on my timeline once it did! I was super pumped about the Got Chocolate Milk folks being there! I've been following their campaign, a spin off of the Got Milk ads back in the day, since it started but had yet to run a race where they were present. 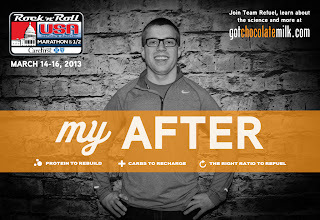 After talking to one of their folks, they asked me to make a video talking about #MyAfter their slogan which I was totally prepared for because Michelle and I always compete for who gets to open the chocolate milk after a hard workout. I usually win. Michelle snagged a bunch of photos while I was filling out the release information and while I was giving my interview. Fingers crossed. Hopeful future member of Team REFUEL! And I already match! My video interview - 477-82 Team REFUEL folks! We weaved our way through the rest of the expo with only minor damage, I made few stops to pick up nutrition for the race, most of which I thought were good deals since most vendors offer "expo" prices. I did cave at the CEP booth and purchased my first pair of Progressive+ compression run socks. This is an obvious marathon no-no - changing routine and wearing new clothing on race day, but there was nothing normal about this race. After about an hour or so at the expo, we decided that we had enough and went off to find a nice place to have our lunch that we brought with us. One cool thing of note in the expo were the TVs surrounding the Team Geico booth that displayed the entire marathon course in some multiple fast forward speed. Below you can see the course at mile marker 22.4 in the photo below...and yes it really was that desolate along the course. Even on race day. The Rock 'n' Roll USA course was displayed on TVs around the Team Geico booth. The video was in fast-forward so that you could see the entire course in about 10 minutes or so of standing there. 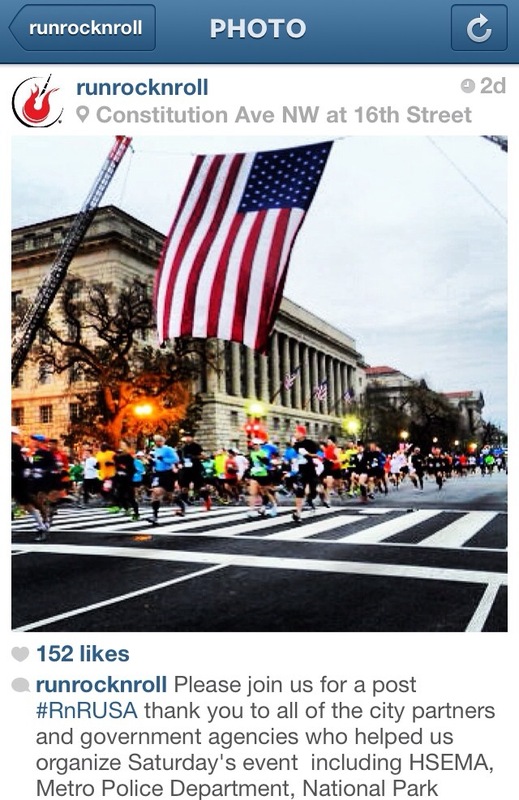 I love DC. I would live there post-graduation if the cost of living were not so outrageous. 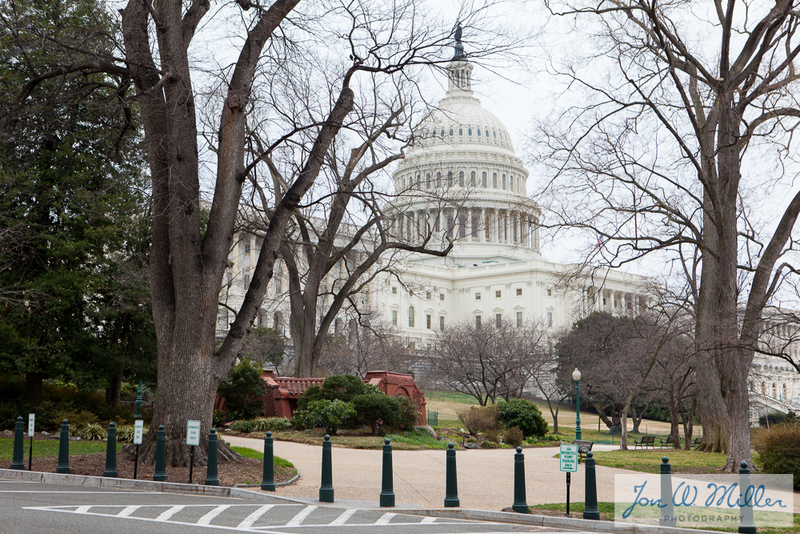 The caliber of races in the area is unparalleled and the biking/running trails/water in addition to all of the museums and monuments make for an awesome place to live. On top of all that there's always cool stuff going on...like when we walked out and saw this helicopter. No. It's not Marine One. I thought it was at first but it lacks the American flag on the white section below the main rotor that usually appears on Marine One regardless of whether it's the Sikorsky UH-60 Black Hawk or the Sikorsky SH-3 Sea King. Either way its pretty neat and a normal site for the city folks, but not for us down here in SW VA.
Another photo using the zoom on the TS4. And the final one I was able to snag before it went behind the tree on the left in this photo. We rode the Orange Line a few stops back and got off at the Smithsonian stop. Both Michelle and I were getting hangry by the time we arrived at the mall so we ate lunch on the first bench we found and tried to keep warm with the howling winds, rather unsuccessfully I might add. We decided to pop into the Museum of Natural History for an hour or so to warm up and did our best to avoid masses of school field trips. 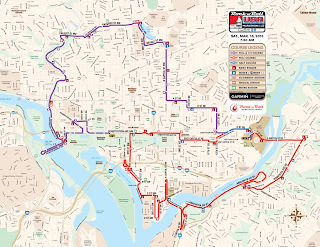 The Orange line runs all the way from Dunn Loring to RFK and the Armory. One line the whole way. Doesn't get much more convenient! A gorgeous DC day even if it was blustery! The Washington Monument with scaffolding at the base to begin fixing damage from the 2011 earthquake. I didn't realize until after researching and watching the video below that half of the 15 million needed to complete the repairs was donated by a private citizen! Cool video talking about the 5 month's it will take to erect the scaffolding prior to beginning the repairs. The rest of the evening was rather uneventful, we did meet up with Michelle's sister and brother-in-law for dinner who were passing through the area. Michelle had no idea that her sister and I had spoken just a couple days before. Friday was a "work"...as in a homework day. Again...I could have been more productive over the break but some is better than none. I did arrive at a conclusion as a pre-service secondary mathematics teacher. If I as 25 year old graduate student, and I would like to consider myself a hardworking and dedicated student, cannot be diligent enough over break to sit-down, focus and accomplish work then there is no way I can expect the same of my future students. Classroom philosophy #17. I digress. 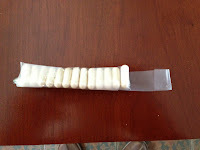 In the afternoon I gathered everything for Saturday and pinned on my number and created this neat faux-PEZ dispenser from a plastic bag. 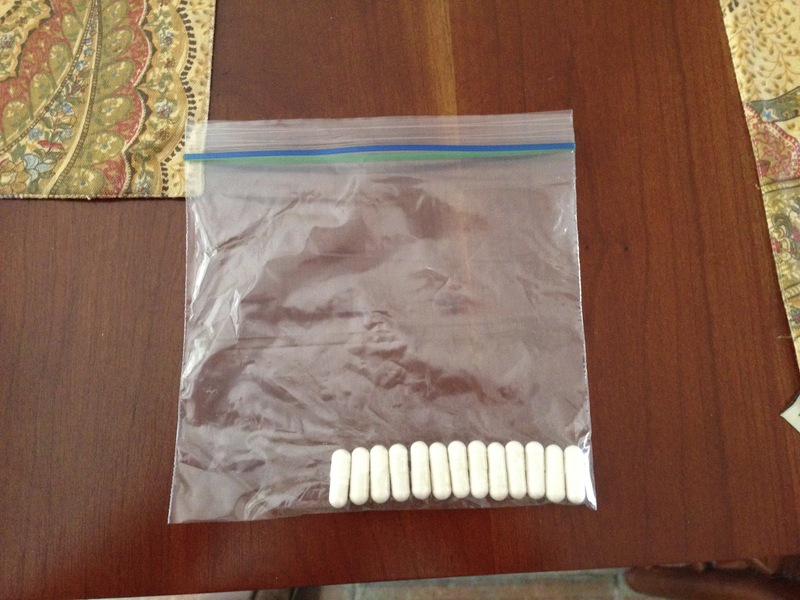 Full bag with Hammer Endurolytes lined up, then rolled and cut the corner to allow each pill to slip out. I used tape to keep everything sealed but after a couple uses on race day (taking one every 20 minutes) the tape didn't stick. I might actually consider a PEZ dispenser next time. Plus it would look sweet on the hydration vest! Dinner was a standard pre-race penne pasta with red sauce and carved rotisserie chicken. I am proud to say that I was actually in at 9 and asleep before 10. A first for me a night before a race. My alarm went off at 3:46 Saturday morning and it was much of a repeat of Thursday except we opted to drive to the West Falls Church metro stop. 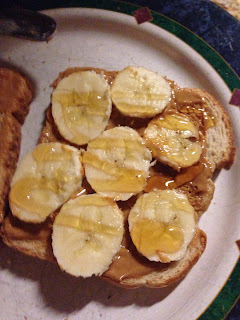 Breakfast was my go to peanut butter-honey-banana on wheat toast and a cup of coffee. Go-to breakfast of champions, peanut butter-honey-banana on wheat toast. I learned many valuable lessons last fall at the Marine Corps marathon but none more important than arriving earlier-than-early to ensure no lines at the bathrooms. Mission accomplished! We got off the metro at the Smithsonian stop a little after 5:30 and walked across the mall to find we had our choice of bathroom...like a lot of choices! A shot down the starting line, Constitution Ave., the corrals were empty and you can see the start line off in the distance! 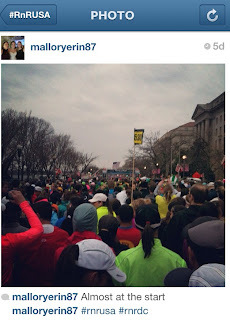 Also of note were all of the restrooms in each corral at the start. First time I had seen this but it was great! A panorama I took of the near the start line while in search for band-aids, you can see the medical tent to the left of the guy in the black where I eventually found them. Having Michelle there was great! I couldn't ask for someone more supportive and patient when my mind is scattered at the crack of dawn. I did have to run around in search of band-aids which I eventually found from a nice volunteer at the medic tent near the start. I was obviously the first person that had come to the tent...granted it was an hour and a half before the race start. I returned to realize that I had left my hydration vest hanging off the edge of the bench with the rest of our stuff, it was "clearly" near Michelle but it made my heart skip a beat when I turned the corner to see it just "hanging out there" in prime position for someone to just walk off with. All the while Michelle is clueless of what was just a few feet to her left, hidden in my hydration compartment. 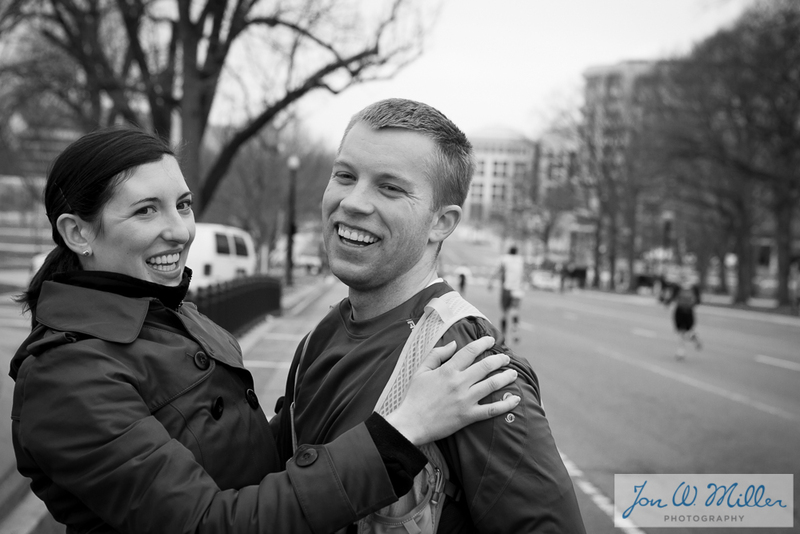 Around 6:50 we headed down to the Constitution Ave. from the mall and began walking down to my corral, 8, when we stopped to have our picture taken. I guess I was too busy taking photos of my camera with all of my stuff on Friday to remember to charge it...whoopsie! Fail #2 (Fail #1 was forgetting band-aids) so unfortunately no photos from here on out (that are mine at least). Michelle hung around with me while I waited in line for a restroom in the corral, these were nice, and around 7:15 I handed her my jacket, put on my black plastic trash bag with a hole cut in it for my head, gave her a kiss and wondered into the crowd to find a good place. My hydration vest was noticeably lighter without the camera in the front pocket and the only time I really wish I had it was at the start for the huge American flag that was suspended between two firetruck ladders...it was an incredible sight. One really neat thing was the wave start based on corral, something that SHOULD be done at the Marine Corps Marathon start. This really helped reduce, and I would argue eliminate, congestion that usually occurs in the first several miles of a big race start. I was able to find these two cool photos of the massive flag I mentioned above. You can see the ladder on the left and just see a small part the ladder on the right in the upper righthand corner. Neat to see both perspectives! **Side note** I couldn't figure out how to embed a search of the #RnRUSA tag from Instagram, but did find a few sites that will search a tag for you. Here's a bunch more photos. The first few miles really flew by. 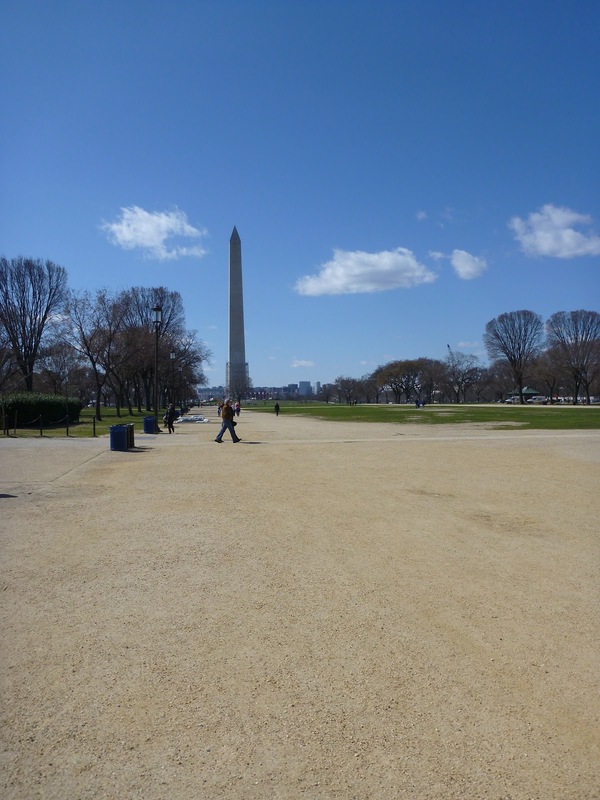 I made conscious effort to enjoy all of the monuments as we ran by them...it's not often you get to run down the middle of a road in the Nations Capital. I fell in with the 3:40 pace group and enjoyed hanging with them for the first half of the race. 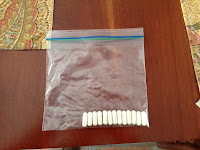 I made sure to pay attention to nutrition drinking every 10 minutes, taking an Endurolyte capsule every 20 minutes, and eating Clif shot bloks every half-hour. 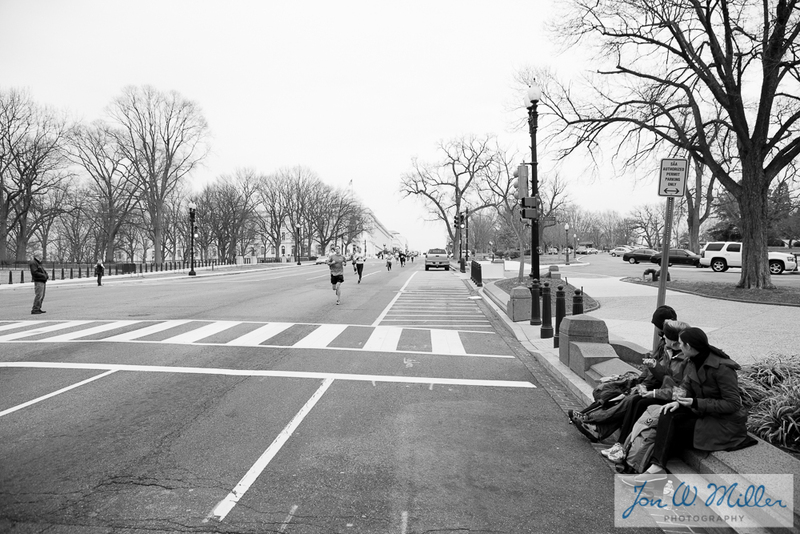 The run was fairly relaxed aside from the one significant climb of the race at mile 6, the climb from Rock Creek Parkway to Calvert street. I've seen a lot of talk in the few days since the race about the execution and amount of support/volunteer/aid stations, mainly complaints of little or no water at aid stations and folks having to fill their own cups. I can't really speak to this as I was carrying all of my own nutrition but did take several water cups during the first half. One observation was that a lot of the volunteers were not wearing latex gloves...something I think is pretty standard. Eventually around mile 13 I pulled off to the side of the road to stretch my right calf. I could start to feel a knot forming and tried to dig my thumb deep into the muscle to hopefully breakup whatever was causing the discomfort. 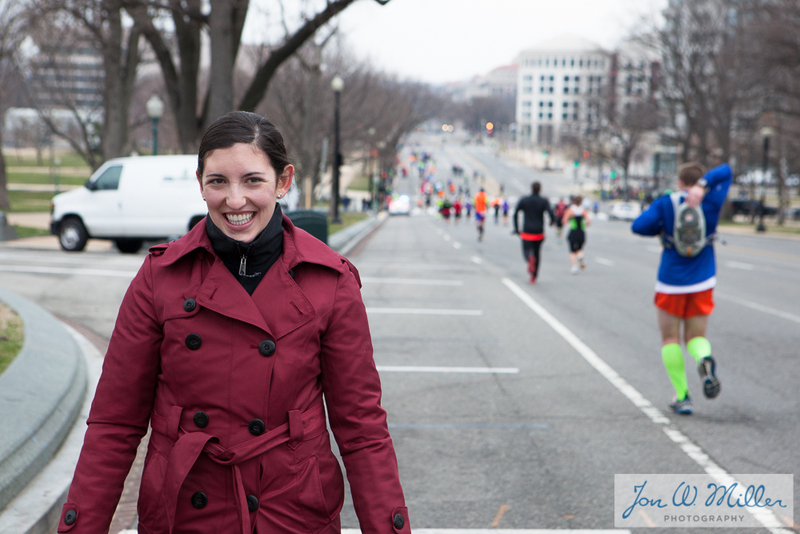 At this point we were running west on East Capitol Street with an awesome view looking ahead. My heart was racing because I knew around the corner on Constitution Ave. there was a downhill across from Upper Senate Park where I would find my friend Jonathan, my parents, and Michelle. 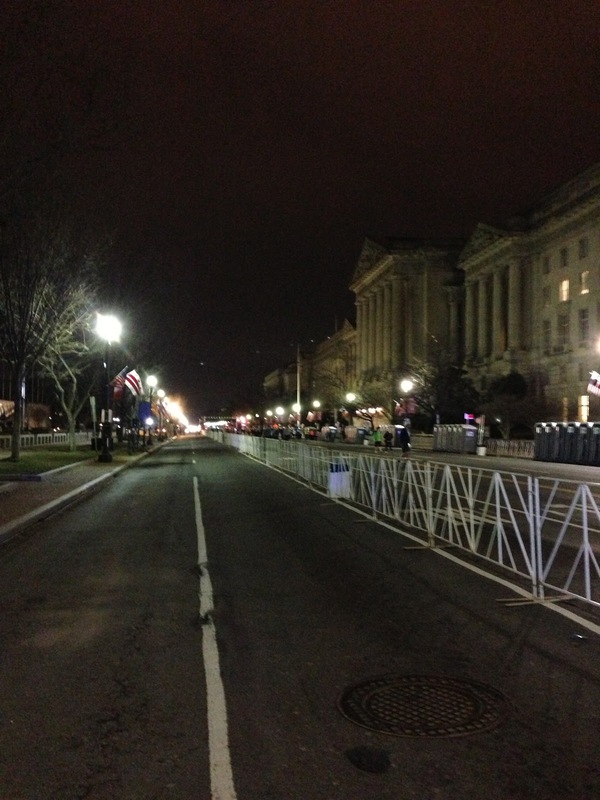 This is where I had told them all would be a good place "to see me run by" and that "it wouldn't be too crowded." I could feel it pressing into my back and was just trying not to smile too much! 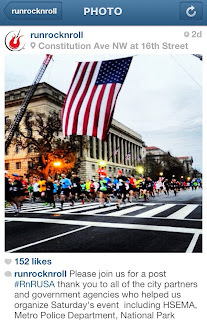 Posted by Unknown at 7:42 PM , Links to this post , 3 comments I'm reading from MyDailyGround: Rock 'n' Roll USA (DC) Marathon Race Report Pt. 1 Tweet this!